Yes, Yes…I’m losing a bit of my steam in this sorting/tossing/packing ritual. I’ve come a long way with a long way still to go. I suppose I need a pause. I do want to get a lot more accomplished before leaving for Maine next week, so I’d better put the kettle on to get some more steam! It’ll be back. But today is Wednesday and of course it’s time for What I Ate Wednesday hostessed by the lovely Jenn at Peas & Crayons. Be sure to check out what everyone will be posting there today. Lots of fun food adventures. Probably a lot more exciting than what we’re finding here. But hey…I’ve been busy, but I’m not letting it keep me from participating. Eggplant parmesan sandwich. this was delicious and since I’d already weighed in for the week at Weight Watchers, I decided to splurge! I spent a lovely few hours with my sister Ele at Dunkin’ Donuts catching up. Mine was an iced coffee with the mint chocolate chip syrup. Yummy! We had fun! Sunday, Ralph and I headed out for lunch. Sure seems like I never cook anymore…well that’s sort of true! 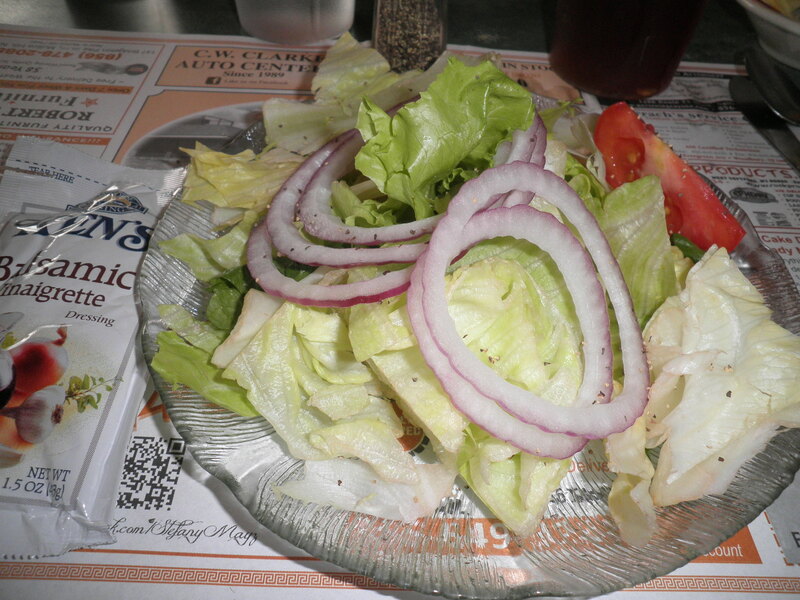 Started with a side salad and balsamic vinaigrette. 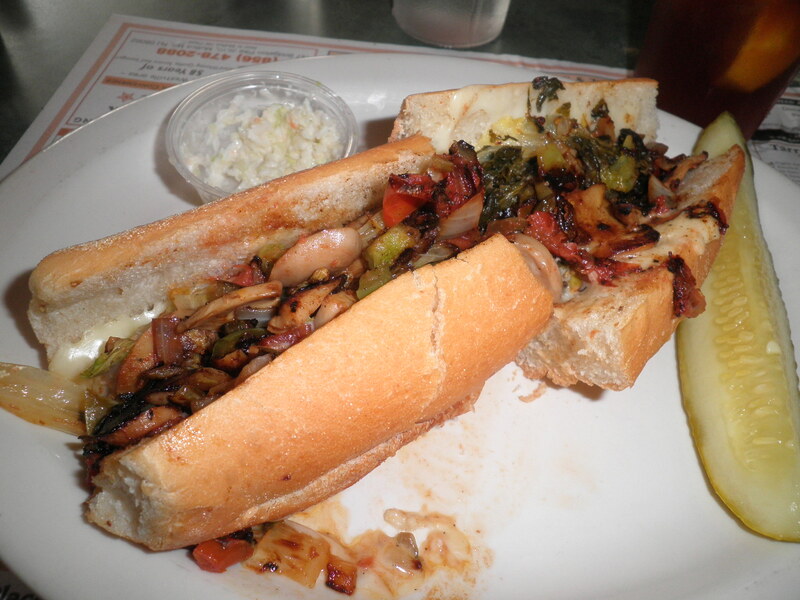 Then one of my favorites, a veggie cheese steak. I almost forgot the photo. I had already eaten my cole slaw and cut my sandwich when I remembered. This was delicious as always, though a bit messy! 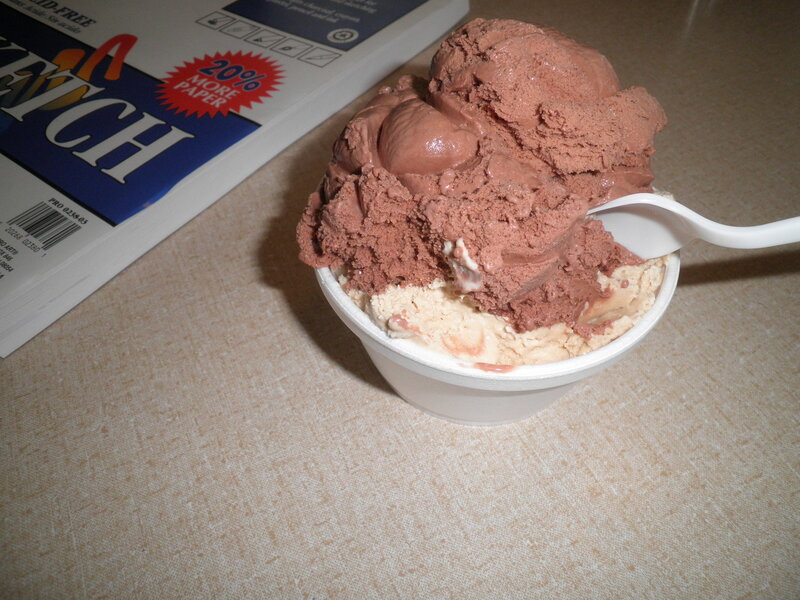 Ok, it was the weekend and I splurged again with ice cream. Coffee on the bottom, chocolate on top. I was really stuffed after this. The sketch book of course is Ralph’s. He rarely goes anywhere without something to draw on. Finally, I actually cooked! Well, about as close as I come to cooking these days. 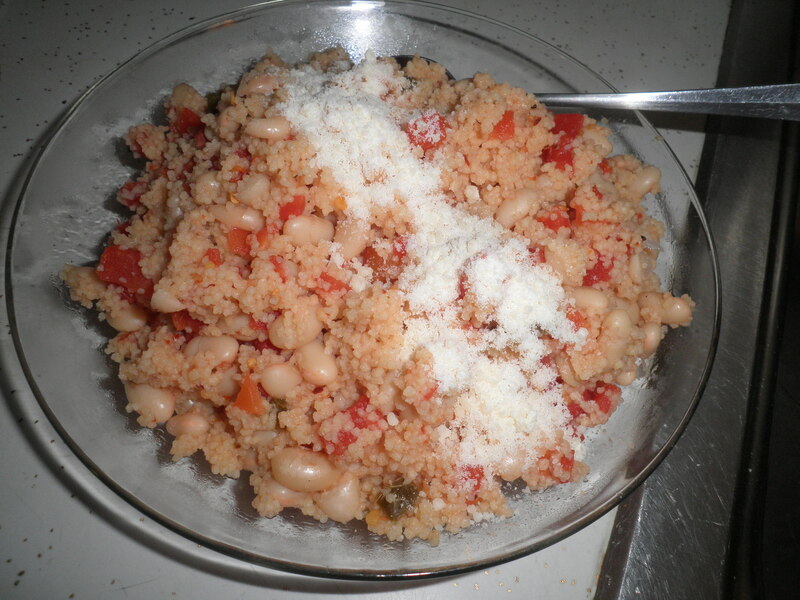 A can of diced tomatoes with green chiles, canned white northern beans and couscous. All topped with Romano cheese. It was very tasty and kept me satisfied for the rest of the night. I’ve been suffering from night-time snacking, but this kept me in line. That’s about it for me for What I Ate Wednesday this week. I’ve got lots of projects lined up. I think talking about it has brought my steam back a bit. I’m hoping to get back on track and pushing for the finish line. If I only knew when the finish line was…I’d feel a lot better. Regardless, I’ll get there! This entry was posted in Uncategorized and tagged sorting and packing, WIAW. Bookmark the permalink. Thanks, Bob, I’m looking forward to it! Thanks, Christine! I’m feeling more motivated. Just needed a day or two off. These are two of my favorite sandwiches. Have a great day! Thanks, Meridien! I’m looking forward to it! That eggplant parmesean sounds like a fantastic idea. I bet the eggplant provides a really nice flavor. Whenever I lose steam just try to get in more sleep. Usually I had stayed up later or worked harder that day and never made up for it. Your steam will come back soon. Madison, the eggplant parm is So good! I’ve been trying to catch up on my sleep and I think it’s helping. Have a great day! Now I want ice cream! I think it’s good to splurge now and again. Better than depriving yourself and then binging! Stacie, we have this wonderful ice cream shop in our town. Everything so fresh and good. I allow myself once per weekend. It’s something to look forward to. I do the same thing with losing stram – I try to give myself a (guilt-free) break and come back to it. 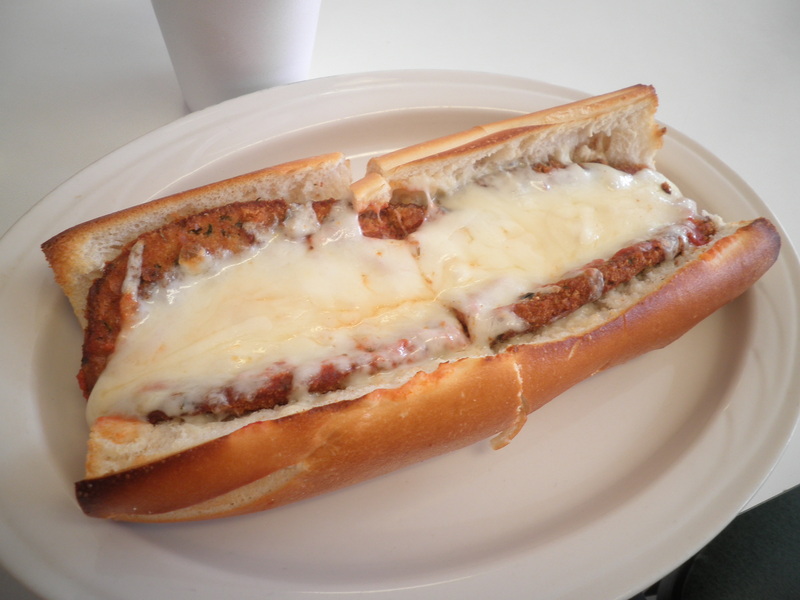 I want that chicken parm sandwich. Yum!! I’m getting back my oomph and I’ve got some good things happening today and tomorrow. We’ll get there! Have a great day, Laura! I’m been suffering from late night snacking as well. It gets kind of ugly around 10 pm when it’s just me and the Chex! I feel your pain my friend. I’m glad I’m not alone, Ameena! Actually, cereal is a good snack choice for me. I’ll eat a little and then be done with it. I should use cereal more often. Good suggestion! Have a great weekend! I love ice cream in the summer time. Matter of fact, I love ice cream anytime so it’s no small wonder I am drooling over your that and your salad. I’m weird, I know.